Stamped on products from coffee to handicrafts, the term “fair trade” has quickly become one of today’s most seductive consumer buzzwords. Purportedly created through fair labor practices, or in ways that are environmentally sustainable, fair-trade products give buyers peace of mind in knowing that, in theory, how they shop can help make the world a better place. Buying into Fair Trade turns the spotlight onto this growing trend, exploring how fair-trade shoppers think about their own altruism within an increasingly global economy. Using over 100 interviews with fair-trade consumers, national leaders of the movement, coffee farmers, and artisans, author Keith Brown describes both the strategies that consumers use to confront the moral contradictions involved in trying to shop ethically and the ways shopkeepers and suppliers reconcile their need to do good with the ever-present need to turn a profit. 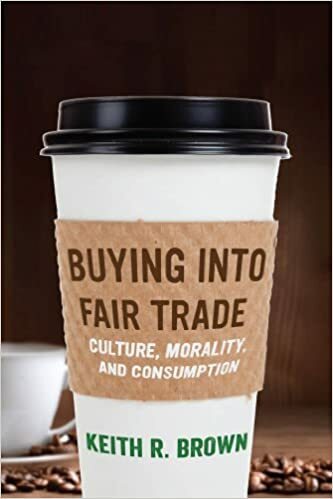 In addition to his in-depth analysis of the fair-trade market, Brown also provides a how-to chapter that outlines strategies readers can use to appear altruistic.This chapter highlights the ways that socially responsible markets have been detached from issues of morality. A fascinating account of how consumers first learn about, understand, and sometimes ignore the ethical implications of shopping, Buying into Fair Trade sheds new light on the potential for the fair trade market to reshape the world into a more socially-just place.